What is Sesame in Chinese Cooking and How Is It Used? Sesame is a mainstay of Chinese cuisine. Toasted white and black sesame seeds are sprinkled on salads, sesame paste is added to sauces, and delightfully aromatic sesame oil is used to flavor everything from dips to marinades and finish off a stir-fry. Sesame is a flowering plant with edible seeds that grow in pods. The seeds have some of the highest oil content of any other seed and are used in several different cuisines around the world. In addition to the seeds themselves, Chinese recipes also feature the seeds after they have been toasted and blended into a paste as well as made into an oil. Sesame paste is made by pulverizing toasted sesame seeds; toasting sesame seeds to make sesame paste is a time-honored culinary technique, giving the paste a different flavor than Mediterranean tahini, which is made from untoasted seeds. Sesame oil is made from pressed and toasted sesame seeds, and this amber-colored, aromatic oil is a popular ingredient in Chinese cooking. It is important to note that the non-roasted sesame oil you sometimes find in supermarkets and health food stores is not a good substitute for the sesame oil used in Asian cooking. As with sesame paste, the difference is that Asian oil is pressed from toasted sesame seeds. The lighter oil is found in Indian cooking, while Asian countries favor the darker variety. Besides its use in cooking, sesame oil is found in holistic preparations for everything from treating infections to stimulating brain activity. It is also believed to contain antioxidants. Thought to have originated in India or Africa, the first written record of sesame dates back to 3,000 BC. According to Assyrian mythology, sesame's origins go back even farther—there is a charming myth about the gods imbibing sesame seed wine the night before they created the earth. References can be found with Babylonians using sesame oil, and Egyptians growing their own sesame to make flour. Ancient Persians relied on it both as a food and for its medicinal qualities. It's unclear, however, when sesame first found its way to China. Some sources claim the Chinese were using sesame oil in their lamps as far back as 5,000 years ago, while others state sesame seeds were introduced into China about 2,000 years ago. It's probably true that the ancients first relied on the sesame plant to provide oil, and only later discovered its value as a food source. The seeds of the sesame plant in its various forms (Sesamum indicum is its scientific name) are used differently in many Asian cuisines. In China, sesame seeds are used to flavor cakes, cookies, and popular desserts such as sesame seed balls and fried custard. You'll also find them in savory dishes. Sesame paste, which is made by pulverizing toasted sesame seeds, is an ingredient in noodle dishes that include a thick, nutty sauce. Sesame oil is added as a flavoring to recipes and is not for use as a cooking oil, as the flavor is too intense and it burns quite easily. 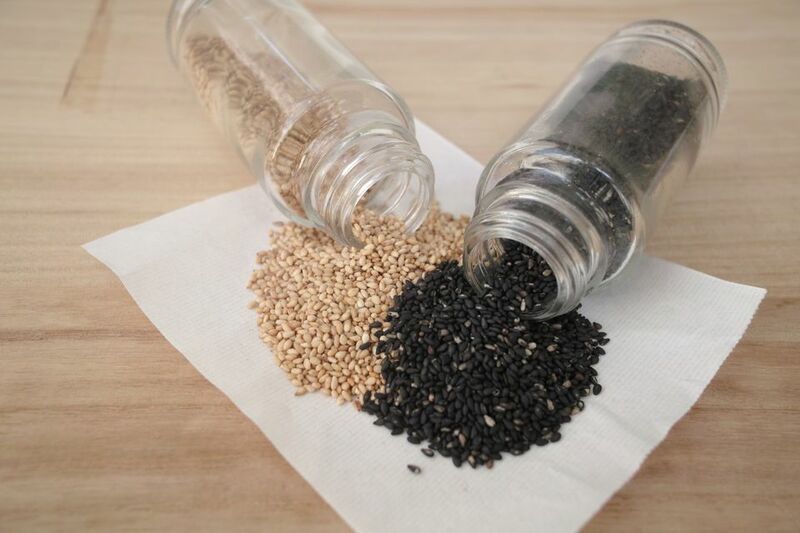 Sesame seeds have a rich, nutty flavor; the white seeds are a bit more subtle in taste while the black sesame seeds—which still contain the hull—are slightly stronger in flavor and a bit more bitter. Because Chinese sesame paste is made from toasted sesame seeds, it has a richer taste compared to tahini, and sesame oil brings a concentrated, intense nuttiness to any dish. It's impossible to do justice to the rich aroma and flavor of sesame paste. In color and texture, it resembles peanut butter, which is often recommended as a substitute. Dieters take note: Sesame paste is rather high in calories—nearly 200 in three tablespoons. On the other hand, a recipe normally only calls for a few teaspoons at most. Sesame seeds, both white and black, are sold in bags and jars in the Asian section and sometimes spice aisle of the supermarket, as well as Asian specialty food stores and online. Sesame paste is commonly sold in glass jars—there are several good Chinese brands on the market, but it can be difficult to find. (You can always make your own.) Don't be surprised when you open the jar to find that the soybean oil used in the paste has separated and formed a layer on top, with the solid paste below. Simply stir the layer of oil back into the paste. Sesame oil is shelved along with the other Asian ingredients in the grocery store. A good brand is Kadoya sesame oil from Japan. Whether a recipe calls for white or black seeds often has more to do with the appearance of a dish rather than flavor. Before using, white sesame seeds are nearly always toasted. There are differing opinions on the value of toasting black sesame seeds, however, as it can accentuate the bitter flavor. Let your taste buds make the decision. Sesame paste simply needs to be stirred to recombine the oil before incorporating into a recipe. When using sesame oil, remember not to cook it over high heat; instead, try adding it to marinades, salad dressings, or in the final stages of cooking. Recipes often call for a few drops of sesame oil to be drizzled on a dish just before serving. You will find many Chinese (and other Asian cuisines) recipes that feature one form or another of sesame. It can be as simple as a beef dish sprinkled with white sesame seeds, noodles with a sauce made of sesame paste, and an asparagus salad dressed with a mixture including sesame oil. Because sesame seeds contain a high percentage of oil, it's best to store them in the refrigerator if you plan on keeping them for more than two or three months. Otherwise, they can be kept in a covered jar at room temperature. In any event, check and make sure they don't smell rancid before using. Once opened, sesame paste should be stored in the refrigerator, where it will last for several months. Sesame oil will keep for several months if stored in a cool, dry place. Sesame seeds are a nutritional goldmine; they are high in mineral content and contain two proteins that are not normally found in other vegetable proteins. For people with milk allergies, sesame seeds provide an alternative source of calcium.